Home > KMS	> kMS ver 1.2.222 – Rankings and New Videos! kMS ver 1.2.222 – Rankings and New Videos! Hey guys! This is just a post letting you know I’m still uploading some cool videos on my YouTube channel, like the one above featuring one of kMS’ level 250 characters, Soft the Aran! Some people have asked so I’ll show you the top 10 ranking in this post. There’s also some other bossing videos and stuff from the last Act of Black Heaven. 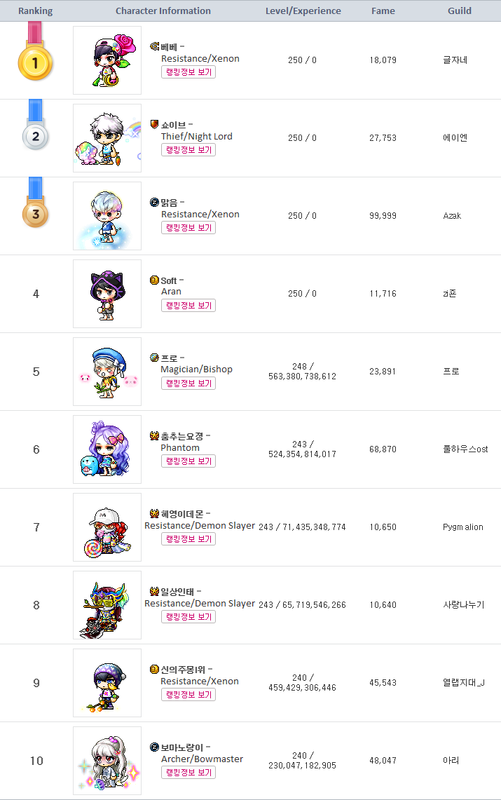 Here’s the top 10 of kMS! As you can see, there are 4 level 250’s. I’m actually surprised an Aran is up there haha. Here’s the Night Walker video, this guy has really good control. I also love the Star Planet damage skin! There were also some cinematic videos added for Act 3 of Black Heaven. This one is where the Black Wings attack Crystal Garden! This one is Gelimer and Suu, after finishing off the Resistance! Finally, here’s a video from Act 3 of Black Heaven. Don’t watch if you don’t want to be spoiled! cod damn naxon. watch less crappy anime, your game is imitating it now. Well emp cygnus bite more than she can chew. Waiting for resistance’s revamp is turning me into ash. Inkwell’s Secret Diary – They are Coming Soon! kMS ver. 1.2.222 – Black Heaven: Second Chapter!